2018/2019 Flex Pass no longer available; 2019/2020 Flex Pass will be available soon. Back by popular demand, the Flex Pass is good for eight admissions to any concert during our 2018/2019 Season except the Holiday show on 12/15/18 and John Gorka on 5/18/19. You enjoy the flexibility to choose which concerts to attend throughout the year, and to share with friends and family. Priced at $100 for eight admissions, if you and a friend attend just four concerts, you’ll save $60 compared to tickets at the door. To use your Flex Pass, simply present at the door, no advance reservations needed. Flex Pass: How do I love you? Let me count the ways! You and a friend attend four concerts each. Gather seven people and attend a concert as a group. 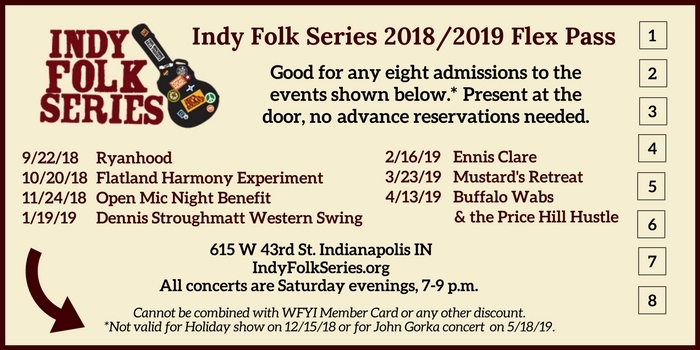 Think of it as Friends & Family night at the Indy Folk Series! You and your spouse attend two concerts in the fall, and then suddenly you are transferred to Alaska! Give your Flex Pass to a friend so they can enjoy the remaining concerts. Give the gift of music! Our Flex Pass makes a thoughtful gift for someone who has no desire to accumulate more “things” but enjoys the experience of live music! Why not order two? One to use and one to share! Order your Flex Pass online, and you’ll receive a confirmation by email. Your Flex Pass will be sent via U.S. mail. We take cash, check, or credit card, and you can use your new Flex Pass for admission that very evening. Send us an email, and we’ll give you the details about where to send the check. Your Flex Pass will be sent via U.S. mail.